Capt. Rick Stanczyk was born and raised in Islamorada, Florida Keys in 1982. His family owns and operates Bud n’ Mary’s Fishing Marina located there. It has been a fishing marina since 1944 and his family has run it since 1978. His father, Capt. Richard Stanczyk Sr., grew up running a charter boat in Miami. Richard Sr. was a backcountry fishing guide in Islamorada for many years, even guiding an angler to the record for largest bonefish on fly ever caught for a period of years. His uncle Capt. Scott Stanczyk and brother Capt. 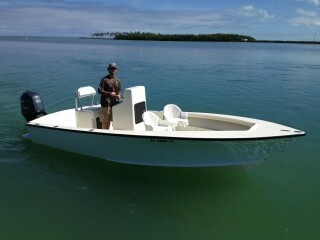 Nick Stanczyk both run offshore boats in the Islamorada area. Scott has won numerous tournaments over the course of the last 30 years. Rick grew up fishing with all three of them, learning how to fish at a very young age. He has been running his own charter business since 2009. He has a complete understanding of fishing this area that combines his families fishing history with the collective knowledge passed down from the numerous captains at Bud n’ Mary’s. You can really say fishing runs in his blood. Capt. Rick runs a completely restored 1977 SeaCraft Center Console boat. It has all the new modern ‘bells and whistles’ and rides like a dream. It is very comfortable for up to 3 anglers. You can read more about it here. Please let me show you the wonderful world of fishing that the Florida Keys has to offer. You’ll enjoy your day on the water with a fun loving captain on a comfortable fishing boat.